Protestors near City Hall, Thursday, April 14, 2016. As promised, several hundred protesters waded along North Broad Street on Thursday afternoon to oppose Temple University’s proposed $126 million football stadium at a site on the northwest corner of its North Philadelphia campus. A broad alliance of neighborhood groups, student organizations and social justice advocates, led by North Philly community group Stadium Stompers, joined at Temple's Bell Tower to demand that the university abandon its plans to construct a 35,000-seat stadium complex complete with a new recreation center and retail space. "Up with the community! Down with the stadium!" "Temple made gentrification!" the protesters shouted. 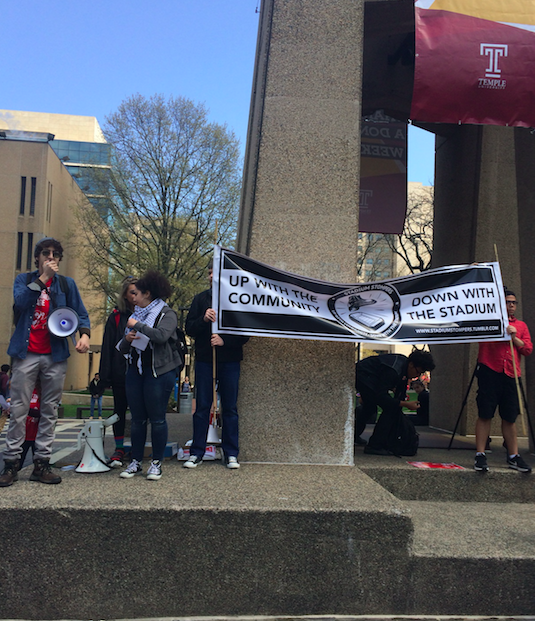 Stadium Stompers rally at Temple's Bell Tower. Speakers representing both community and student groups rebuked the university's Board of Trustees, who envision the stadium development at a site bounded by Broad Street west to 16th Street and Norris Street south to Montgomery Avenue. 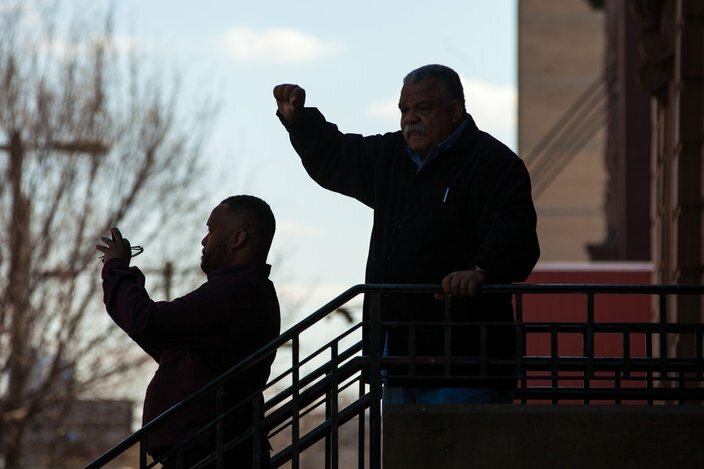 "Don't let anyone tell you that you should adjust to injustice," said Anthony Monteiro, a former associate professor of African American Studies at Temple whose contract, controversially, was not renewed in 2014. "You have a right to be on the right side of history and what is moral. You don't have to go along to get along!" On the surface, Temple’s push for a football stadium symbolizes the growth of Philadelphia’s largest public university in a city renowned for its higher education. This fall, Temple will welcome its largest freshman class in university history, an infusion of nearly 7,100 new undergraduates. The Owls, meanwhile, are coming off an AAC East Division football title in a season marked by local fervor and national acclaim. Underlying all that good news for the university, however, is a thicket of issues concerning both the neighborhoods of North Philadelphia and the recent history of Temple’s athletics department. For decades, according to protesters, Temple’s expansion has encroached on the needs of the community, altering the area’s physical landscape and spreading an untamed campus atmosphere that has burdened residents with noise, trash and parking issues, and a gradual suppression of local identity. From the outset of the stadium initiative, Temple officials have pledged to consult with community members to address their concerns, formulate inclusive ideas and develop a facility that respects residents in North Philadelphia. In February, Temple’s Board of Trustees approved $1 million in funding for initial stadium designs and studies assessing the usage options, and environmental and community impacts of the proposed complex. The university hired Moody Nolan, the largest African-American architecture firm in the United States, to conduct a feasibility study and engage with community members to identify sticking points that transcend architecture and the acquisition of real estate. 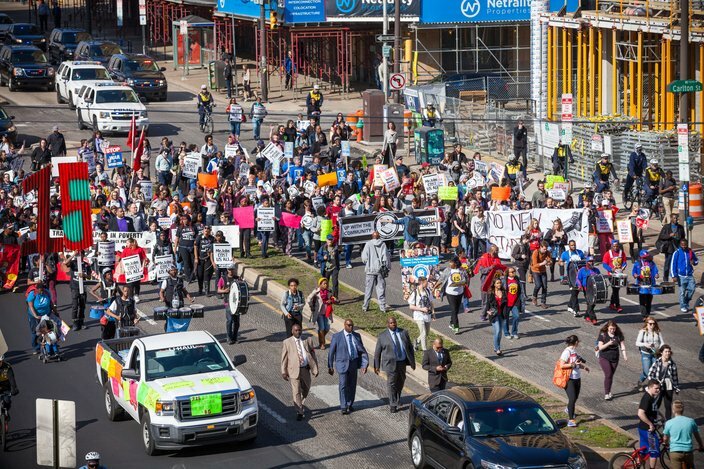 Protestors march south on Broad Street near Callowhill Street on Thursday, April 14, 2016. Anticipating local resistance, the university even announced this month that it will double down on off-campus policing to mitigate disturbances caused by excessive drinking in privately-owned student housing. The revised Student Conduct Code now imposes steeper fines, stricter building code compliance and extended liability for leaseholders in the event of violations. The focus of the groups participating in Thursday’s protest, including the Black Student Union, points toward a raft of existing issues that complicate Temple’s ideal of a harmonious stadium development process – from crime and displacement to fears of a development process that keeps residents out of the loop. Tyler Ray, 18, an organizer for Stadium Stompers and lifelong North Philadelphia resident, told PhillyVoice that the stadium opposition is really about demanding a more civil, transparent relationship between Temple and its neighbors. "It was very sneaky the way Temple introduced this," Ray said. "They tried to hide it from the public, never really consulted with us, and then all of a sudden we got news that they wanted to build a stadium at 15th and Norris. That puts it directly in front of houses, obscures the skyline and eliminates open green space. My plans are to fight as hard as I can to stop the stadium from being built. If it is built, I will make sure that community members have a voice in how it will be used." Ray said that any potential stadium should be available year-round to community members, no matter the cost, and job opportunities should be prioritized for local residents. While Temple's efforts to address litter and student conduct are important steps, Ray believes the bigger issue is that the university tacitly discourages student engagement with the neighborhood. "Where does this mentality come from?" Ray asked. "I think we're looked at sometimes as a bad group of people, even enemies who might hurt people. This is a serious issue, and since Temple is an inner city campus, they have to make an extra push to connect with the community. Residents can be just as stubborn, so both sides really need to form that bridge." 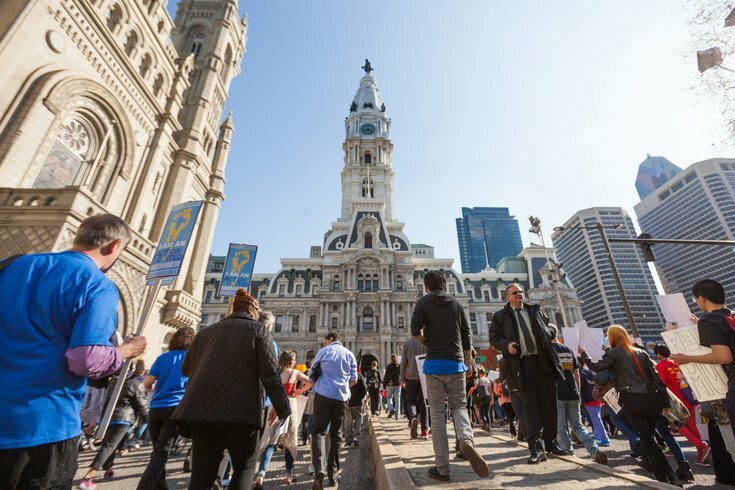 If anything, Ray argued, building a stadium in North Philadelphia could attract more crime to the area and require a significant law enforcement presence – yet another concern protesters have with the proposal. In an area marked by frequent crime, the issue of stop-and-frisk policing has become particularly worrisome. Stadium Stompers references a 2008 University of Colorado study that found a sharp uptick in assaults, vandalism and arrests for disorderly conduct and alcohol-related offenses on Game Day at 26 Division 1-A college football programs. That possibility of concentrated chaos on weekends is a major concern for Joan Briley, a resident of the 1500 block of Norris Street – right where the stadium is proposed. She echoed concerns about a sense of secretiveness about Temple's plans that is partly the result of confusion about when and where the university has met with residents on the plan. "They haven't really addressed our grievances before moving ahead," Briley said. "I wasn't blown away by a meeting with the architects and I still oppose the stadium. To have 35,000 people come out here for seven games a year, there are risks with that and it doesn't seem like enough to pay for it all, anyway. So are they going to bring concerts here? We want Temple to be honest with us." "In these early stages of the process, we have held small meetings focusing on leaders from the blocks that will be closest to the potential stadium and retail complex. We have also met with faith leaders from the community. "The goal in these early meetings was to help everyone have an opportunity to speak, listen and learn. As the head of the Moody Nolan architecture firm has said: 'Smaller groups allow for better and more in-depth discussions. It also allows time to actually connect with people during meetings.' Information from these meetings has been very valuable and has already brought results. Temple officials declined to provide information about future meetings or address the perception among some in the community that it has not been forthright and transparent in the stadium planning process. The university's board of trustees says funding for the stadium complex would come from a combination of private donations and bonds supported by money redirected from Temple's rent payments to Lincoln Financial Field, where the Owls football team has played its home games since 2003. The lease at the Linc expires in 2017 and the Eagles are asking for $2 million in rent and $12 million up front, double the previous cost to use the stadium in South Philadelphia. From an athletics standpoint, Temple's bid to elevate the Owls football program came at a painful price to the university. Late in 2013, Temple cut seven of its 24 varsity programs, explaining the decision as part of its migration to align with the standards of similar athletics programs in the AAC, as well as an initiative to boost scholarship funding and improve facilities. The decision resulted in job cuts and students transferring to colleges that could support their athletic goals. 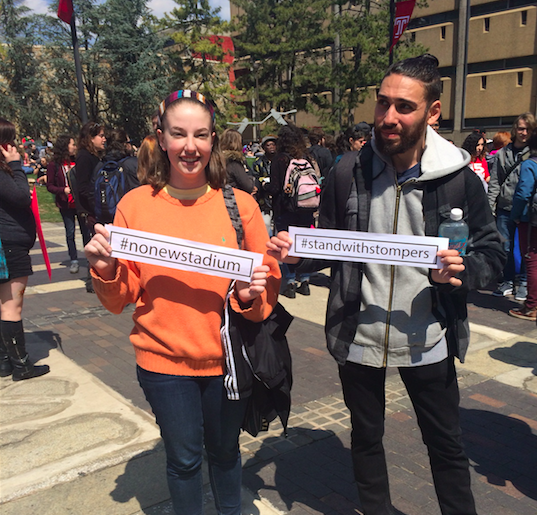 Despite promises that the stadium will not be financed through tuition hikes, several Temple students said Thursday they have concerns about the proposal. Dale Mahoney, a senior in Temple's Film & Theatre program, told PhillyVoice that the university's $175 million budget deficit – explained by President Neil Theobald as a state funding issue – could potentially result in more layoffs, tuition increases and a fewer free student services. Given the school's expanding enrollment, Mahoney said funding could be better directed to other resources. "I appreciate football and the camaraderie it brings to Temple, but I don't think it's good for the community or for students," Mahoney said. "I have heard mostly anti-stadium viewpoints on campus, and the issue could end up dividing student support for our teams. It's not worth displacing residents to justify a stadium, and I don't think Temple anticipated the backlash." Temple students hold signs in protest of stadium proposal. Dixie-Sue Hodge, a freshman graphic design major, said students should be more involved in the planning process if the stadium is going to happen. "I think they should renew the contract at the Linc," Hodge said, "or at least get students and the community to vote for it in some way." Freshman nursing student Brittany Gardner said a new stadium could have a positive effect on the university and the communities of North Philadelphia. "From the school's standpoint, we're going to make a lot of money, drive attendance and save on shuttle costs to the Linc," Gardner said. "If the stadium can be used by high schools and other neighborhood groups can benefit from it, that would be for the best." Adding a stadium in North Philadelphia would fuel rapid gentrification and impact neighbors, said Johanna Booth, a media studies major. "This is not the area for a stadium," said Booth, who wore an Owls football sweatshirt. "The campus should stay the way it is. The problem of gentrification is my biggest issue. It's going to change the whole dynamic of North Philadelphia. Students here and guests from other schools could cause disruptions and damages. There's more they could be doing for the community, not against it." Moody Nolan President and CEO Curtis Moody told Temple News that the firm's feasibility study could take between three and four months to complete. In the interim, doubts have emerged from the outside that Temple's estimate of $126 million could be much lower than the actual cost to construct the stadium. Joel Maxcy, a professor of sports management at Drexel, and a former Temple professor, told Billy Penn that the cost of a 35,000-seat stadium could be much closer to $200 million. He compared the proposal to similar AAC stadium projects at Tulane and the University of Houston, which built their facilities for $75 million and $128 million, respectively. Those schools, he said, made creative seating adjustments to meet capacity goals while limiting costs. But even if Temple stays within budget, a Philadelphia Inquirer report from January delves into the attendance challenges faced by universities once a new stadium opens. In 2009, for instance, The University of Akron opened its 27,000-seat InfoCision stadium to encourage school spirit and raise revenue. The average crowd was 17,387 that year, but dropped to 9,275 by 2012. Matt Rhule's Temple football program would likely benefit from the stadium as a recruitment tool, yet not even a perennially competitive team may be enough to maintain healthy attendance numbers and revenues. Shortly after Temple downsized its athletics program, experts told the Philadelphia Business Journal they thought the university may have sought a stadium on campus to boost football revenue. How Temple plans to engage a community that includes healthy opposition to a stadium remains to be seen, but the protests Thursday would suggest the university will have to address these issues and reconcile years of skepticism and distrust. "We're not here to condemn Temple in its entirety," said Fiona Cavanagh, leader of Temple's Feminist Majority Leadership Alliance, "but the impacts of inequality add up and intertwine."